Steve Jackson Games has been publishing magazines and periodicals since 1980! Here is information on (nearly) all of the zines we've released over the years. Subscriptions to our current zine and many digital back issues are available on Warehouse 23; check each zine's entry below for specific links. Pyramid is a PDF magazine available monthly through Warehouse 23. Devoted almost exclusively to RPGs, most articles provide both systemless support and new material for GURPS. (We're all fans of the gaming gamut, so we may also cover other systems from time to time.) For over 20 years, Pyramid has continued its proud tradition of bringing you the best in gaming. Each monthly issue is tied to a specific theme; past topics have included post-apocalyptic action, psionics, swashbucklers, epic magic, weird science, steampunk, and many more. The current volume of Pyramid began in 2008. Each issue may be purchased for download individually, or get a discount by subscribing today to receive the latest issues of Pyramid for three months, six months, or a full year. Pyramid Magazine was first published in the summer of 1993 as a paper magazine. It had 30 bimonthly issues and two best-of compilations (Best of Pyramid Volume 1 and Volume 2). In 1998, Pyramid became an all-Internet weekly publication, which lasted for 10 years (and 538 weekly issues!). All 30 issues of the original volume of Pyramid are available electronically from Warehouse 23. A digital bundle of all 30 issues is also available. 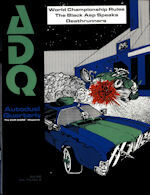 Autoduel Quarterly – also known as ADQ – was the official support magazine for Car Wars. It included new rules, ideas, scenarios, background information, fiction, and more for that setting. The first issue of Autoduel Quarterly was released in Spring 1983 and ran for 10 years – 40 issues total – ending in January 1993. The full run of ADQ is available electronically from Warehouse 23; each individual issue is for sale as a downloadable PDF – check this link to Warehouse 23 for the complete list. Roleplayer provided print support for GURPS. 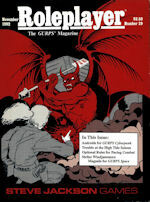 In fact, its first issue – dated February 1986 – was released before the first edition of GURPS was! Roleplayer started life as a four-page newsletter, growing to eight pages, then a 16-page magazine, and – finally – a 32-page magazine. It featured new rules, options, and ideas for GURPS players. 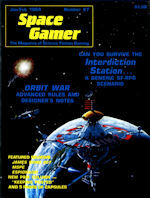 The final issue was #30 and cover-dated January 1993; after that, support for GURPS folded into Pyramid (above). Full PDF recreations of those issues are available electronically and may be purchased individually from Warehouse 23, or as a bundle. Free text-only archives are available from the Roleplayer page. Fantasy Gamer began in 1983, as a fantasy-themed counterpart to Space Gamer's sci-fi focus. 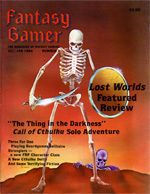 Fantasy Gamer lasted for six bimonthly issues, from August/September 1983 to June/July 1984. Fantasy-related content folded back into Space Gamer after then. Fantasy Gamer covered all aspects of fantasy-themed hobby gaming: RPGs, wargames, card and strategy games, and more. It also featured industry news and reviews. Although Fantasy Gamer is still a great read in its own right, today it's also a fascinating look at an earlier era of hobby gaming. All the issues of Fantasy Gamer that were published by Steve Jackson Games are available digitally at Warehouse 23. First published in 1979 by GDW, Inc., the Journal of the Travellers' Aid Society was the official online magazine of Traveller. Its first Internet-only issue was in February of 2000. During its run it had over 500 HTML installments and one compilation (GURPS Traveller: The Best of JTAS Volume 1). 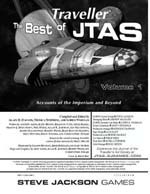 The last HTML issue of JTAS published by Steve Jackson Games was in December 2015.